Alert: If your child uses Skype, read this. A friend of mine recently told me her child had a bad experience when a stranger called him on Skype. She didn’t know that you can set Skype up so that no one except your contacts can Skype you. Personally, I think everyone’s Skype should be set up this way (mine is), but it’s especially important when children use Skype. Here is how to get to settings which will help you maintain your child’s privacy. This isn’t all you should do. You still have to monitor your child’s usage and account, check contact lists yourself, make sure the computer is in a common area in your home for maximum awareness of what is going on, and talk to your child about how to use Skype, who to Skype with, to tell you when they receive a contact request, etc. 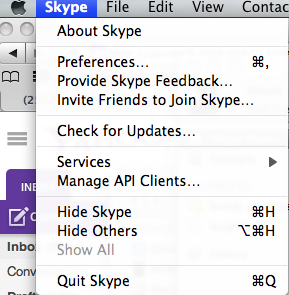 Go under the Skype menu and choose Preferences. Set up Skype so only your contacts can call you. Also, make sure “show my status on the web” is unchecked. 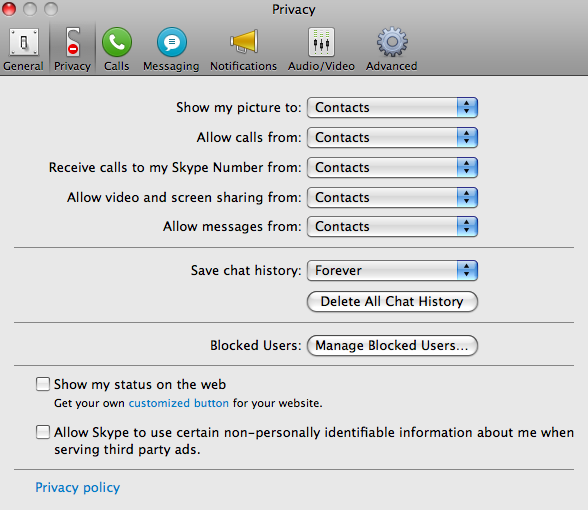 If someone has your Skype name, they can still request contact with you with these settings. This entry was posted on Tuesday, April 2nd, 2013 at 1:58 pm and is filed under Kid. You can follow any responses to this entry through the RSS 2.0 feed. You can leave a response, or trackback from your own site.